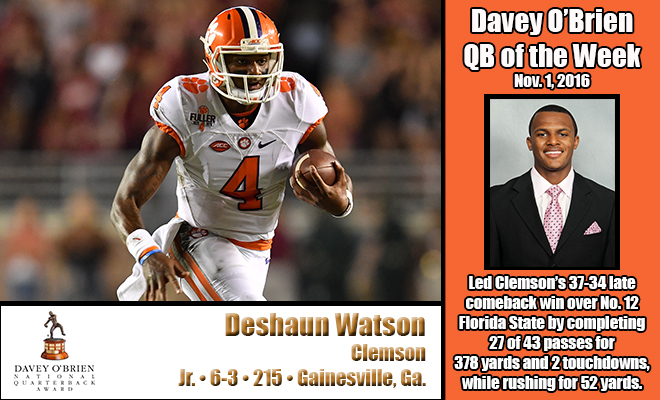 FORT WORTH, Texas (Nov. 1, 2016) – Deshaun Watson, the 2015 Davey O’Brien National Quarterback Award winner from Clemson, has been named the Davey O’Brien Quarterback of the Week for the second time in the past five weeks, the foundation has announced. Watson led Clemson’s 37-34 late comeback win at No. 12 Florida State by amassing 430 total yards. Trailing 34-29, Watson engineered the winning scoring drive capped by his 34-yard touchdown pass and 2-point conversion toss with 2:06 left. On the night, the native of Gainesville, Ga., completed 27 of 43 passes for 378 yards and two touchdowns and added 52 rushing yards on 17 carries. Nationally, Watson ranks 10th in touchdown passes (22), 11th in points responsible for per game (18.3) and 13th in total offense per game (332.4). With an 8-0 record, the Tigers are ranked third in the country in the AP Top 25 and the Coaches’ Poll. It is the fifth time in nine weeks this season that an ACC quarterback has claimed the honor. Watson and Louisville’s Lamar Jackson (Sept. 13, Sept. 20) are the only players to receive the honor multiple times this season. All FBS quarterbacks are eligible for the weekly award, which is determined by a subset of the Davey O’Brien National Selection Committee. The other “Great 8” quarterbacks in week nine were: Jackson, Jerod Evans of Virginia Tech, Washington State’s Luke Falk, Quinton Flowers of USF, Oregon’s Justin Herbert, Mason Rudolph of Oklahoma State and Georgia Tech’s Justin Thomas. The Davey O’Brien Foundation is celebrating its 40th anniversary in 2016 and has granted nearly $1 million in scholarships and university grants to help high school and college athletes transform leadership on the field into leadership in life. The Davey O’Brien National Quarterback Award winner will be announced on Dec. 8 during ESPN’s The Home Depot College Football Awards. The winner is not required to have won a weekly award during the season. A list of 16 semifinalists will be announced on Nov. 10, while the three finalists will be named on Nov. 22. The Davey O’Brien Fan Vote, now in its 10th year, gives fans a chance to play a role in determining the award winner by voting daily at VoteOBrien.org.